There is an oft‐repeated story that in 1807, two Newfoundlands were saved from a shipwrecked brig off the coast of Maryland. The two Newfoundlands that were saved were mated with local retrievers including English Otter Hounds, Flat-Coated Retrievers and Curly-Coated Retrievers. This cross created one of the best waterfowl hunting companions ever developed. Known for their enthusiasm and endurance, the breed became a favorite of the commercial duck hunter. The breed belongs to the Retriever and Sporting breed groups. They are sometimes called the Chessie, CBR, or Chesapeake. Today the Chesapeake is primarily a family pet, watchdog, and hunting companion. 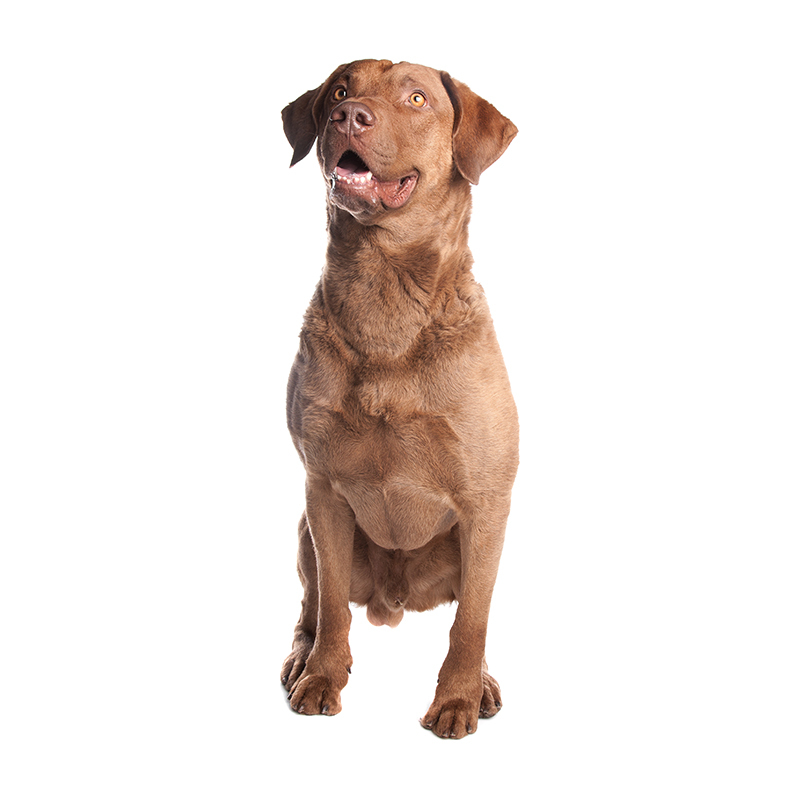 The Chesapeake Bay Retriever is friendly and loving. They are obedient, brave and intelligent dogs. They have a passion for the water, swimming and retrieving, and retain the mental toughness that was necessary for their early work. The CBR makes an excellent jogging or hiking companion and do exceptionally well in obedience and field trials. They can sometimes be aggressive towards other dogs. The Chesapeake is very protective of its family and is known to be a guardian of children, saving more than a few from drowning. They can be quite territorial, which is something of an oddity for a retriever. The Chesapeake Bay Retriever usually weighs between 55 to 80 pounds and stands approximately 21 to 26 inches tall. They have a muscular and athletic build. They have a coarse coat that is rough and thick and usually comes in solid colors such as brown and tan. In 1964, the Chesapeake Bay Retriever was declared the official dog of Maryland. It is the mascot of the University of Maryland, Baltimore County. Some famous people who owned a Chesapeake were General George Custer, President Theodore Roosevelt, and actors Paul Walker and Tom Felton. Although most modern families could hardly provide the kind of work performed by this dog in the past, who “all his life worked an average of five days of every seven,” it is definitely necessary to provide them with adequate exercise and some kind of job to make him – and ultimately you – happy.